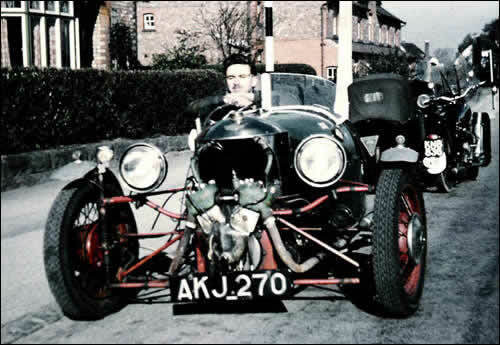 "At the time I also had the BSA 500 and sidecar seen behind it. I got the 1934 Morgan for £65. It was at the time of the Suez crisis and because they weren't able to test people, I was able to drive it around on my own on a provisional license. I sold it for £85. One of the problems was that the petrol tank was just above your knees and it was gravity fed to the carb between the water cooled Matchless engine. There was so little fall to the carb that it had problems when going up steep hills! This was made worse on hot days when the petrol would evaporate in the pipe before it even got there. I would then have to get out and tickle the carb and restart it with a handle. The car had a manual Advance Retard on the steering wheel and if you forgot that it was advanced when you went to restart it, it would have a kick like a mule."